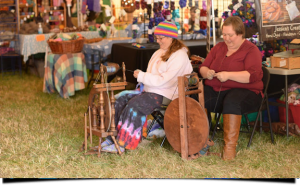 The Wool Tent will have raw, washed and ready to spin fleeces from all breeds of fiber animals, including sheep, alpacas, goats, llamas, rabbits. They also have natural colored and dyed roving and yarns, spinning, weaving, rug hooking, knitting and crocheting tools, woven rugs, knitted and crocheted hats and headbands, wet felted and needle felted finished goods, photography, note cards, Christmas items, sheep and crafting novelties and more. There will be educational demonstrations going throughout the weekend. Stop in and learn to spin, knit, crochet, weave, needle felt and process wool. Be inspired!